“If you are lucky enough to have lived in Paris as a young man, then wherever you go for the rest of your life, it stays with you, for Paris is a moveable feast.” Ernest Hemingway to a friend, 1950. “To Lori, An invitation to our feast. Love….” written in this book given to me by my husband as we began our married life. The book was new, as were our dreams. He gave me Paris and it was a “moveable feast”. 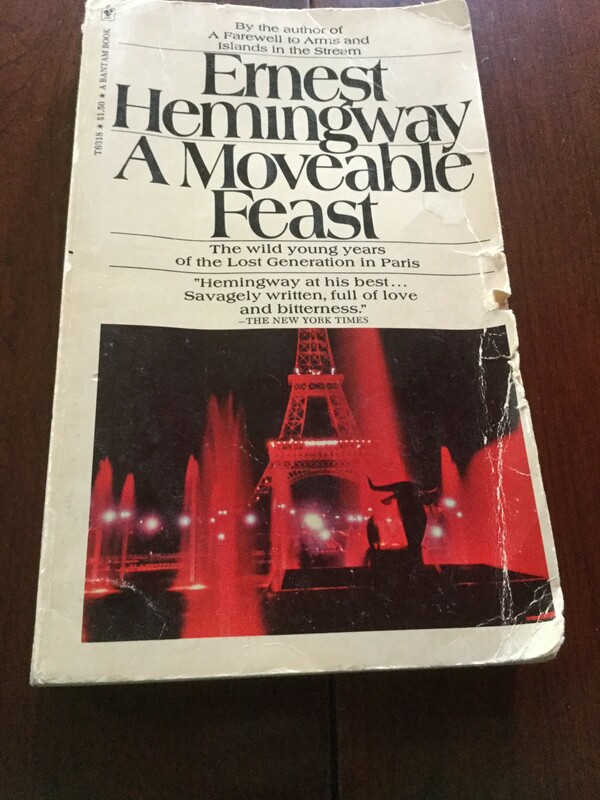 Posted on April 10, 2016 April 10, 2016 by lorigreerPosted in My JourneyTagged A Moveable Feast, Ernest Hemingway, Love, Paris. Very few Hemingway ‘fans’ seem to know of this gem…has been a particular favourite of mine long since. Best of good fortune be upon you both. This is a beautiful post. It touches something. I ‘feel’ what you have shared. thank you. Thank you, Faye. Very kind words. I just downloaded it. I wonder if the happiness is built into the book. Reading it brings back many happy memories for me. I hope reading it makes you happy too! Thanks. I’m looking forward to it. I am not much of a Hemingway fan (although I’ve read nearly all of his work). However, this book along with the Nick Adams stories are exceptions for me. I LOVED A Moveable Feast–the people, the city… so much to enjoy. Your husband is a smart person to gift this book! I spend a lot of time in Michigan’s UP in some of the territory Hemingway wrote about in the In Our Time Nick Adams stories. He was quite the fly fisherman, I guess! Enjoying your posts! Shakespeare & Company…what a delightful place to shop and soak up the atmosphere of the “lost generation”! I will be in Paris soon and that is a definite stop. Thanks for sharing your comments. Thank you! If you have a moment, pleasetc read my post: Paris? Oui! I can’t believe I haven’t read this…but I will now. Merci! Enjoy! I leave soon for Paris. I haven’t read this particular book. I’ll add it to my wish list and read it with a more touching perspective knowing Dan gave it to you with such love in his heart. Love you and miss you my friend! Hi, Thank you. Love & miss you too!! Wish you were going to Paris with me today! Talk soon. Do you have “what’s app”? I am going to use it while traveling. Lori, for some reason I was thinking of Babette’s Feast. Great book and movie too. I will need to read this one….my kind of book. Thanks. I’ll send this book to my daughter who is living in Paris for a couple of years. Thanks also for the follow on my blog.